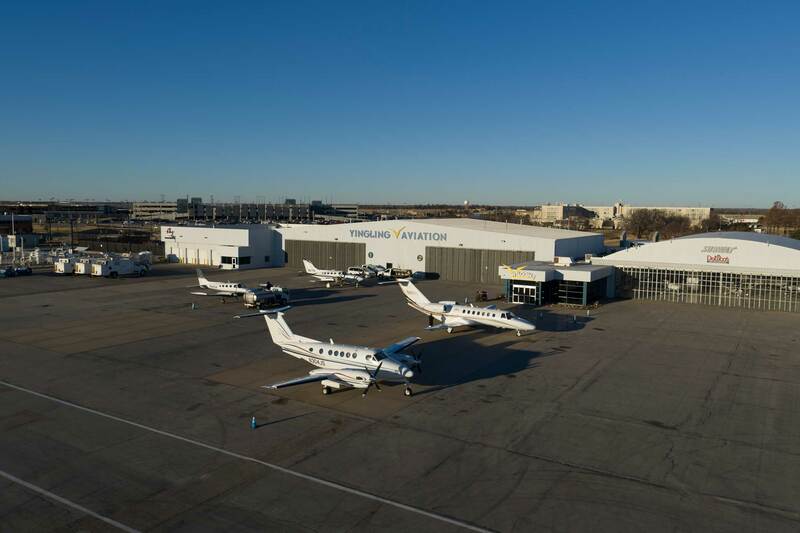 Yingling Aviation is marking its 73rd year in business in 2019 and is at the front end of an expansion project that’s adding 70,000 sq ft to the full-service FBO at Wichita Eisenhower National Airport (ICT). It’s part of CEO and owner Lynn Nichols's plan to build upon Yingling’s MRO capabilities, as well as strengthen its services as an independent FBO. Yingling was founded in 1946 by Vic Yingling Jr., an Army Air Corps captain and son of a Wichita car dealer, at the former Wichita Municipal Airport on the city’s south side. When city fathers decided to build a new commercial airport farther west, Yingling moved with it and in 1954 became then-Mid-Continent Airport’s first tenant. The company holds the distinction of becoming the first Cessna dealer and took delivery of its first Cessna 140 demonstrator directly from Cessna CEO Dwane Wallace in 1946. Nichols, a multi-engine and instrument-rated pilot, bought Yingling in 2000 from Salina, Kansas, businessman Jerry Vanier. Nichols, the son of a 40-year Cessna employee, had spent the previous 13 years owning and presiding over office technology companies. Since acquiring Yingling, Nichols has expanded the company’s footprint on the west side of Runway 1R/19L from 56,000 sq ft to 125,000 sq ft, most of which was for hangar and maintenance-related expansion. That figure doesn’t include 70 T-hangars and a 10,000-sq-ft propeller maintenance shop a quarter of a mile away from Yingling’s main facilities, which is an authorized service center for McCauley, MT, Hartzell, and Sensenich. Last year, the company completed a refreshing of its publicly accessible interior space and its 8,000-sq-ft terminal with new wall coverings, furniture, light fixtures, flooring, and reception and refreshment counters. Yingling also provides a private lounge for transient pilots accessed only by a keypad and featuring four leather recliners positioned around a large-screen TV. There's also a stocked snack bar and a separate sleep room. Other amenities include courtesy cars; on-site car rental through Enterprise, Hertz, and Budget; on-site customs; and catering. Perhaps two of its more distinctive service offerings are Aviator’s Attic, a pilot and gift shop, and its 46-seat Subway Café/Mama DeLuca’s pizza restaurant with a view of one of its hangar that opens up to what can be a very busy ramp. Yingling sees a lot of transient military fixed-wing and rotorcraft traffic because it has a federal government fueling contract, Nichols said. Yingling provides Phillips 66-branded jet-A and 100 low-lead avgas to its customers, including a few of the seven airlines that serve Eisenhower. Its jet-A fuel service is provided by one of two trucks while its avgas is offered as full- or self-service. Yingling gets its jet-A through a Wichita Airport Authority-owned storage and distribution facility at Eisenhower that comprises six, 25,000-gallon storage tanks. Two other 25,000-gallon tanks that store avgas are being converted to jet-A storage. Assistant director of airports Brad Christopher told AIN Eisenhower needs more jet-A capacity and sees relatively low demand for avgas. The tank conversion will leave Yingling and its competitor, Signature Flight Support, to store their own avgas. Nichols said Yingling plans to add an above-ground 12,500-gallon avgas tank this spring. Yingling also offers Type I de-icing and Type IV anti-icing for commercial, corporate and general aviation aircraft using three specialized trucks. Both Nicholses hope new developments on the FBO side of the house, as well as expanding capabilities in maintenance, repair, and overhaul, will continue the company’s growth well beyond 73 years. Yingling is an FAA and EASA certified repair station and an authorized service center for Cessna, Beechcraft, Blackhawk, Raisbeck, Garmin, and Honeywell. It also is a Cessna parts distributor. While Yingling’s widely known as an FBO, fully 85 percent of its business comes from its MRO activities, Lynn Nichols said. Newly enlarged facilities to perform that work that the company announced in December will enable Yingling to further expand its MRO capabilities to work on aircraft as large as a midsize Citation Sovereign, he said. “We’re building a very nice King Air and Citation customer list, just in the last three years,” Nichols said. The construction of a 23,000-sq-ft avionics and maintenance hangar, and the lease-acquisition and renovation of a 50,000-square-foot former Hawker Beechcraft Services building just north of Yingling’s main facilities, enables Yingling’s MRO expansion, as well as the addition of an aircraft paint operation made possible with the Beechcraft building. The paint operation rounds out the company’s capabilities in interiors completions, airframe, and avionics modifications and installations, as well as engine repair and replacement. Yingling expects to add up to 25 more employees with the MRO expansion, including painters, A&Ps, avionics techs, and sheet metal workers. The company currently employs 125. There is one MRO activity that the company launched in 2015 that it’s since put on hold: the Ascend 172 remanufactured airplane program. When Yingling and Nichols unveiled the program and its first 172 at the 2015 AirVenture in Oshkosh, Wisconsin, the idea was to buy 1970s-era Cessna 172s, restore the airframes and engines and equip them with modern avionics and new interiors. The initial price of a base Ascend 172 was set at $159,000 a fraction of the cost of a factory new 172. But Nichols said the amount of labor each Ascend took, as well as rising costs of parts combined with almost double the market value of used 172s, means Yingling has suspended the program. “That’s the one that probably disappoints me,” he said. “We always felt like we could take it up in product line” to the Beechcraft Bonanza and even King Air.